The best situation comedy offers a healthy dose of emotionality. Without it, efforts like Will & Grace can get slapsticky. Sometimes the show still works, like Jack and Karen getting hooked on the Trucks For Tots jingle a few weeks ago, but sometimes, like last week, there’s little for even the devoted viewer to latch onto. Which is what made “The Wedding” such an improvement. Even though the last Will & Grace season left with Will happily settled down with adorable cop Vince (Bobby Cannavale), we hadn’t really received the true story behind their breakup. And apparently, Will hadn’t either. He’s so manic about finding out the truth that we get as caught up in the mystery of why Vince dumped him as he does, even though it’s painfully obvious right from their first scene together, as Will corrects Vince almost constantly. Karen and Jack were shoved to the background, but at least in an effective manner, with Karen collecting items for a scavenger hunt, and Jack hooking up with one of Vince’s cop friends. Sure, Karen calling out Ivanka for using the Russians to help her win a scavenger hunt is a bit on the nose, but the show can’t seem to help itself. It’s almost worth it to see Karen hang with a monkey or steal a badge from a cop. Jack got some nice moments though, as he winds up with a man who’s never been with a man before. Not sure why Drew’s wife had to be so awful she’d quote ancient SNL lines as actual humor, but it’s interesting to see Jack play the role of compassionate sexual mentor (and continues to next episode, in an unlikely move for this round of the show, having a guest star roll over). Drew’s immediate clinginess is kind of adorable, so I’m glad Ryan Pinkston is returning to see how this all plays out. Sorry, Angela. 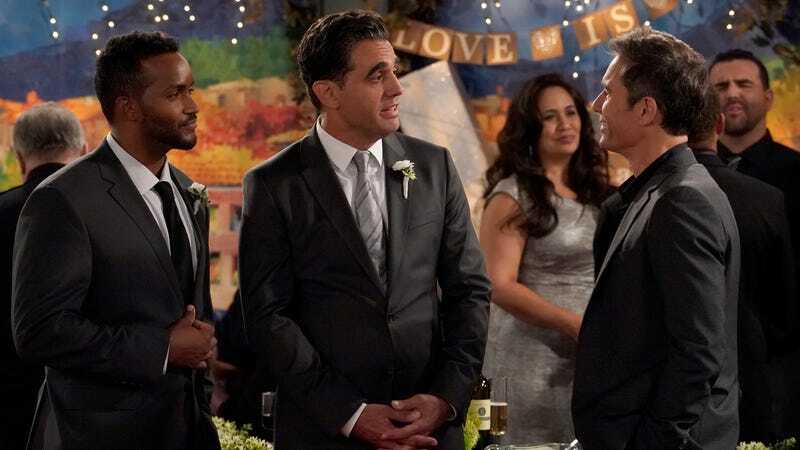 We already know that Will and Grace are almost entirely self-centered people who really don’t think twice about making a couple’s wedding entirely about them. We’ve seen them do something similar countless times before. But this time is different, because it seems like Will might have actually (we hope) learned something. Vince was stronger than Will: He realized that Will didn’t really like who he was, so he left him after five years and went out and found someone who did. It’s an interesting revelation for Will, too, to find out why the relationship didn’t work and to take another look at himself. We’re all constantly (or should be) still evolving and changing, no matter what stage of adulthood we happen to be at. After so many episodes of stagnation, it’s nice to see Will actually come to a realization and resolve, which can only bode well for his next turn at the relationship bat. “A live monkey’s worth 100 points. A live Kardashian’s only worth 80.” Karen’s expression here was priceless. Shoutout to fellow NBC shows This Is Us and Saturday Night Live. This week in “Do I hate Grace’s outfit as much as Karen would?”: Oh my god, absolutely. I can’t believe Karen didn’t even comment on Grace’s ice blue flouncy monstrosity. And yet, she liked Jack’s romper. Antidote episode: Not really needed here, but in the tradition of Will & Grace exes, I like “Bed, Bath & Beyond” in season four, the one after Grace breaks up with Woody Harrelson’s Nathan. Next episode: We skip a week, so see you back here in this space on February 1 for the return of Drew in “Staten Island Ferry.” Also we get a Karen flashback, which I’m really looking forward to.